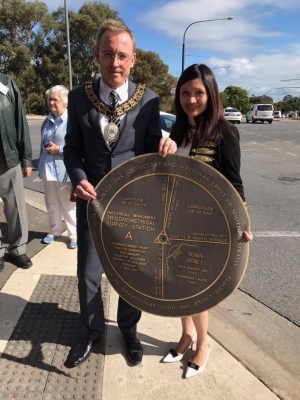 The 180th Anniversary of the commencement of Light’s District of Adelaide Trigonometrical (Trig) Survey – Trig Station A Historical Monumentation was celebrated with a commemoration program in Adelaide, Australia. The celebration was of the first surveying program with a coordinates grid for allotting lands. The marking of the first point of that survey is remembered with a bronze plaque to be installed on the first point. FIG International Institution for the History of Surveying and Measurement, IIHS&M, has been helpful in this process. "...the imminent Federation Internationale des Geometres (FIG) Annual Conference of 1000 delegates in Helsinki on 29 May 2017 and the opportunity for this monumentation of Colonel Light’s District of Adelaide Trigonometrical Survey to be acknowledged at this international conference". Director of FIG IIHSM, Jan de Graeve, gave a presentation at the FIG General Assembly on 29 May which was endorsed by the General Assembly. 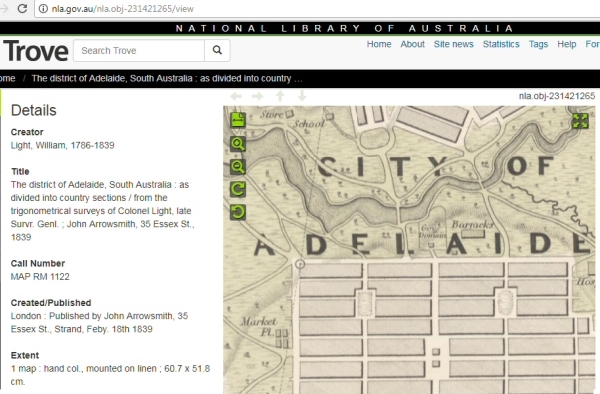 At the ceremony in Adelaide, the Lord Mayor stated that "The Council acknowledges the vision of Colonel William Light in determining the site for Adelaide and the design of the City with its six squares and surrounding belt of continuous Park Lands which is recognised on the National Heritage List as one of the greatest examples of Australia’s planning heritage". 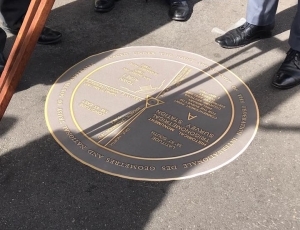 The bronze survey mark is 800 mm in diameter commemorating the 180th Anniversary of the commencement of Light’s District of Adelaide Trigonometrical Survey. The 180th anniversary gift presentation to the Surveyor-General was a facsimile-sized print copy of the Oct 1838 "Plan of the District of Adelaide". Kelly Henderson who has been very active and efficient represented the IIHS&M and FIG on this ceremony. Both the Surveyor General and the Mayor received a high-resolution digital image on a USB key as well as a copy of FIG Publication No.50 History of Surveying. 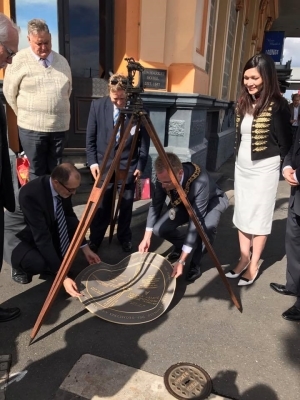 The Surveyor-General and Surveyor Kim Nisbet were thanked for providing the survey equipment and re-enactment of the turning of the first angle of Light's 1837 District of Adelaide Trigonometrical Survey, which was a highlight of the commemorative event. The Surveyor-General's Address very clearly stated that professional practices established by Light were of such a high standard that they are in use today, and the longevity of good record keeping practice is such as to enable accurate re-location and marking of old survey points, for example enabling the GI Nail now marking Trig Station A to be driven into the original Peg hole! The initial start was in 2010 when Jan de Graeve met Kelly Henderson at the FIG Congress 2010 in Sydney, Australia. Jan de Graeve says "Congratulations with the plaque on point 1 of the first coordinated survey in Australia and the preservation of the Park Lands as designed by Willian Light. I am very proud of what you (Kelly Henderson) have achieved and happy that I had an opportunity to meet you at the right moment and to have proposed the approval of the FIG general assembly in Sydney to recognize the importance of William Lights achievements . The FIG General Assembly 2010 received a proposal for World Heritage nomination of William Light's Adelaide Plan for the UNESCO World Heritage List. IIHS&M have been working on this project since the FIG Sydney conference. The GI Nail now marking Trig Station A, was fixed in response to the request of Jan de Grave and Kelly Henderson, in person, for the Surveyor-General's assistance with locating Trig Station A, at their meeting with Mr Burdett in the Lands Department office of the Surveyor-General, Adelaide, 2014. The provision of historic surveying equipment was a crucial part of the impact of the event and a great highlight of the occasion, and it gives me great pleasure to add in closing that the provenance for that survey equipment (theodolite and tripod) should now have added to it the fact that it was used by The Lady Mayoress of Adelaide Genevieve Theseira-Haese to take a sighting down West Terrace from Trig Station A, on the occasion of the 180th anniversary of the commencement of Light's District of Adelaide Trigonometrical Survey, Tuesday 2 May 2017. The Right Honourable The Lord Mayor of Adelaide Martin Haese (right) and Mr Michael Burdett, Surveyor-General of South Australia and also representing the Surveyors Board of SA, laying interim Historical Monumentation to mark and interpret Trig Station A, pending emplacement of a permanent bronze monument. Mr Alexander Augustus Pairin Kitingan, Honorary Consul of Malaysia in Adelaide (far right) whose attendance acknowledges Surveyor-General William Light having been born in Kuala Kedah, Malaysia; The Lady Mayoress of Adelaide, Genevieve Theseira-Haese; City of Adelaide Councillor Alexander Wilkinson; Mr Ken Jacobs,Vice President, Pioneers Association of SA Inc, and Professor Norman Etherington AM, President of the National Trust of South Australia.